Where do they end up most? 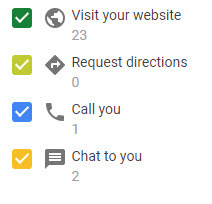 If you ever check the stats from your Google My Business Listing you may notice something interesting. Most users who end up on a Google Listing end up in the same place AFTER they stop on the listing. The user may check out reviews. They might be looking at some photos. And… more times than not… they end up clicking to check out the website. That’s why it’s amazing to think of how many old and tired sites that are out there representing businesses. The image below is a week’s worth of stats from a Google Listing. You can see web visits dominate. And when the site is set up right, the leads will be generated, the calls will come in.